Make yourself at home with Chester, our February 2016 release. This theme travels light, focusing on essential design elements and paying special attention to detail. It features four custom widgets, the additional Sidepanel position, different main navigation layouts and a bunch of useful little helpers. 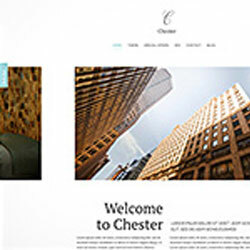 With its spacious layout and elegant typography, Chester will perfectly represent a hotel, inn or any other grastronomy business, though it's versatile enough to work great with any kind of website.